St. Joseph's Frontier Casino is one of many local businesses impacted by the flooding. 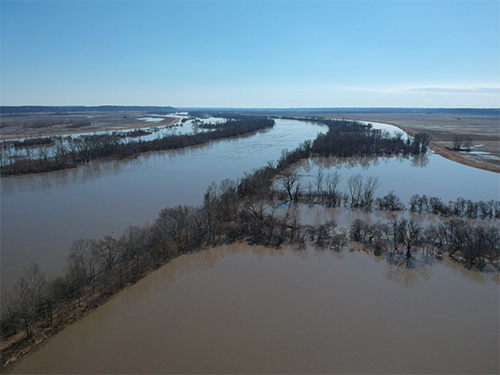 COLUMBIA - Parts of northwest Missouri are being evacuated following severe flooding throughout the day. Officials in St. Joseph called on some people to leave certain areas due to high water. Photos taken by the father of Jacqueline Janorschke, a student at MU, show large portions of an area near where they live under water. Janorschke's mother was evacuated from work Friday due to the high water level. Michele Janorschke said evacuations have intensified throughout the day. "We have just started to evacuate homes and businesses in the south of St. Joseph. That started this morning. It's become mandatory. The police department is going door to door for businesses in that area as well as homes in that area...traffic is being rerouted as well," Michele Janorschke said. Jacqueline Janorschke said people's living situations are also being affected. "I know a couple down there who just built this brand new house. They remodeled it and everything. And now, they are going to have to not live in it because of the flood," Jacqueline Janorschke said. Macyn McClurg, another MU student from St. Joseph, said she is concerned about the long term impact the flooding could have on the community. "When you have flooding like that, it totally just erodes the soil. They have already fertilizing and getting that area ready for next year. Having that saturation of water depletes the nutrients in the soil and its ability to grow good crops for the next year," McClurg said. The Missouri Department of Agriculture reports that St. Joseph's Buchanan county gathers $5.5 billion in sales from their agriculture industry, the second highest mark in the state. The American Red Cross says the best way to help right now is with a financial contribution to the American Red Cross Disaster Fund. If you want to donate, you can call 800-red-cross or visit redcross.org. You can also text "Red Cross" to 90999 to make a $10 donation.